What’s In YOUR wallet, Product Manager? So here’s a minor topic that might have some real significance for all product managers: what do you put on your business card? Yeah, yeah, I know that we’re living in the age of FaceBook and LinkedIn but business cards are still what we exchange when we meet people face-to-face. What this means is that business cards still matter. What’s on your business card? 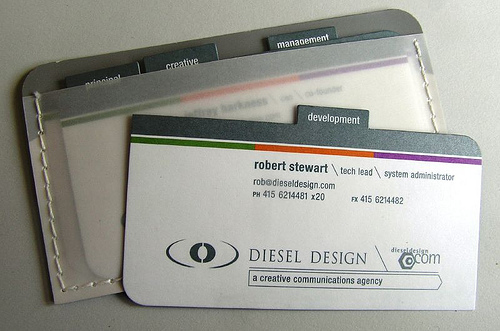 At this point in my career I must have had no less than 20 different business cards. Every once in awhile I’ll see a collection of them huddled together in the bottom of some drawer somewhere and I’ll have to smile as I realize just how much my description of myself and what I do has changed over time. I’ll never forget when I got my first opportunity to sign up for business cards. This was it, I had made the big time. Despite being a lowly software engineer now I was finally going to have an “adult” way to communicate to others just how important I was. As with all large firms, most of the format of the business card was pre-established. However, I was given free rein to add my job title just under my name. Hmm, what to put? The first time out of the gate I put what the company listed for me in the corporate directory: “Software Engineer IV” or whatever. It turns out that this was a big mistake. Outside of people who worked for my company, nobody else in the real world knew what a Software Engineer IV was! I’d get polite smiles and then the card would quickly disapper into someone’s pocket to probably be thrown away when it came time to do laundry. A few business card iterations later, I started to get smarter. By this time I had moved over into the world of Product Management and so I changed my job title to “Product Manager”. This was much better. I don’t think very many people knew what a Product Manager was or did, but they sure thought that they knew what a manager did and so upon receiving my card they slotted me as a mid-level manager and left it at that. The promotions came over time and whereas I was not yet a Vice President or a CIO yet, I had become a Senior Product Manager. At the next opportunity I updated the business card title to read “Senior Product Manager”. This seemed to garner me just a little bit more respect when I handed the card out. Once again, I don’t think that very many people knew what I did; however, they seemed to believe that I was now in the upper echelons of mid-level managers. I was still finding that since folks didn’t actually know what a Product Manager does, they were struggling to pigeonhole me based on my title. The trick here is that if people can’t figure out quickly where you fit in the totem pole of responsibility, then they will end up not even bothering to try. I felt that one more evolution was required. I ended up dropping the “Product” and so today my business card reads simply “Senior Manager”. Although less descriptive, I’ve found this title to be of great use at trade shows and when meeting with vendors. No, they still really don’t seem to know what I do for the company; however, they are easily able to realize that a “Senior Manager” is someone who must be very important. This means that they treat me as being someone important because they don’t have any reason not to. One final note, with my obtuse title the very first question that I get asked is “what do you do?” This is a make-or-break question. If I identify myself as a Product Manager, this will get me classified as a low-level worker bee because nobody really knows what a Product Manager does. Over countless encounters like this I have honed my response to reply with a quick “I make problems go away.” In most cases, this generates quiet respect and there are no more probing questions. How does your business card currently describe you? Did you get to pick your title or did the company pick it for you? Do people that you give your busienss card to understand what you do? If you could change your title, what would you change it to? Leave a comment and let me know what you are thinking.